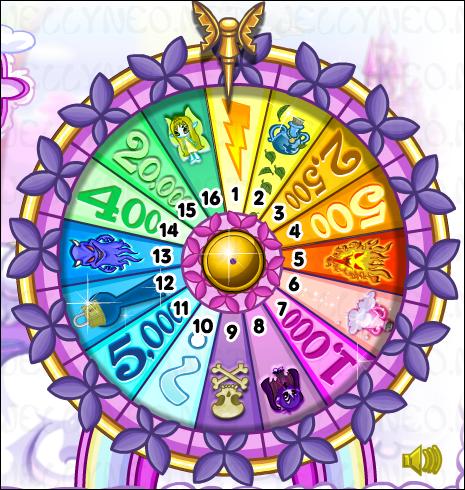 This delightful wheel in the heart of Faerieland costs 500 NP to spin! You can spin this wheel once every 2 hours. 1 All your pets lose half their health. 2 Your pets are healed. 3 You win 2,500 NP! 4 You win 500 NP! 5 All your pets will lose some Hit Points. 6 A random magic item (including bottled faeries, morphing potions). 7 You win 1,000 NP! 9 Your active pet comes down with a disease (Chickaroo). 10 A mystery amount of Neopoints (between 100 - 350 NP). 11 You win 5,000 NP! 12 "Something mysterious happens to you and your pets... you are not sure what it is, however..."
13 The Pant Devil steals something from your inventory. Note: This space has been glitched since inventories were overhauled. You will not lose any items. 14 You win 400 NP! 15 You win 20,000 NP and an avatar! When the wheel lands on Space 2 ("Your pets are healed.") your fifth pet will not be included & will stay at the number of hit points it had before the spin. It is as of yet unknown as to whether the fifth pet is affected negatively by landing on Spaces 1 & 5.